It happened earlier in the summer at the Sachsenring when a mechanic for team AB Cardion Ducati crossed pit lane without looking, right onto the path of Aprilia rider Mattia Pasini. Pasini ended up banging his head hard on the pavement and in the hospital for a check up. The mechanic was ok but the bike almost ended up inside Rossi's pit box. 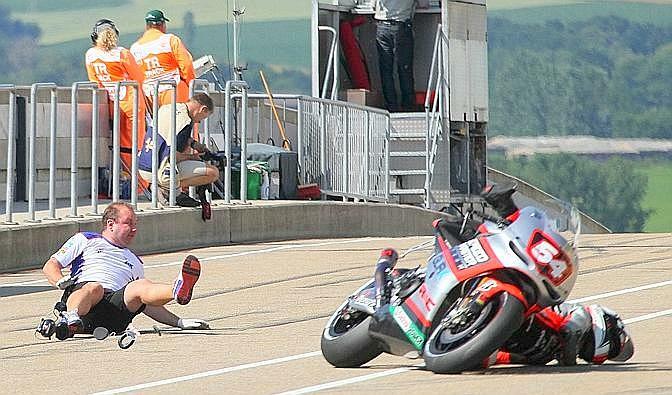 Amazingly Pasini was allowed to race though obviously concussed and confused after the fall. Something should be done regarding this. Even in F1, you can see people crossing the pitlane towards the pitwalls all the time, even during the races, sometimes even with incoming cars about to pit.